﻿ The 35 Best Folk Music Venues in the U.S. Although folk music may have hit its zenith in the 1960s, the genre still thrives today, along with a dedicated base of fans. It lives in music venues on each coast as well as hundreds of places in between. Folk music is still with us because it connects the listener, and the artist, to our cultural heritage. The tunes and lyrics describe who we are and where we came from. Below is a list of the top 35 folk venues in the United States. We've listed the venues alphabetically by state. These 35 venues are not necessarily dedicated to folk music, but they are places where folk music indeed thrives. They are also elite live music venues with superb acoustics, sightlines, and atmospheres, all qualities needed to make our list. The deciding factor, however, was enthusiasm. The following 35 venues exhibit a fervor for folk music that is almost palatable. The people behind these venues love what they do and they love folk music. And, as you'll soon read, many of these venues are run by volunteers. The Lost Leaf Bar & Gallery is an amazing venue for any type of show, especially folk music. For one, all their shows are free. Two, the establishment is built on "creativity and conversation." Three, they offer a huge selection of beer, wine, sake, cider, mead, and lambic. And four, they care about artists. Over the years, the Lost Leaf has donated more than a quarter of a million dollars to Phoenix-area musicians. Freight & Salvage Coffeehouse brings music from all corners of the world to Northern California. Legends that have graced their stage include Country Joe & The Fish, Alice Stuart, Barbara Dane, and R. Crumb and his Cheap Suit Serenaders. Freight was destined to be a mecca for folk music. When you're founded in Berkeley in 1968 there' really nothing else you can be. Freight & Salvage Coffeehouse. Photo courtesy of venue's Facebook page. McCabe' Guitar Shop is a rare place. Without leaving their complex, you can buy a folk instrument and then attend a folk concert. Serving musicians and music fans since 1958, McCabe' is both a concert venue and an instrument shop. Names that have appeared on their marquee include Griffin House, The Dustbowl Revival, Jake Xerxes Fussell, and Bobby Long. The San Diego Bluegrass Society aims to educate, promote, and organize bluegrass music in the San Diego area. Besides producing concerts, they also host open mic nights and jam sessions. Many of their events are booked at Fuddruckers Restaurant, Boll Weevil Restaurant, and Our Savior Lutheran Church. The San Diego Bluegrass Society can also help you find a bluegrass band for your event. Inspired by the Denver Folklore Center, and founded in 1979, Swallow Hill Music is a nonprofit focused on bringing "the joy of music to life every day." They are as synonymous with the city of Denver as the Broncos and being a mile above the sea. Annually, they enrich the lives of more than 165,000 music fans. DFC produces concerts all over the city. Some of the venues they use include Daniels Hall, Tuft Theatre, Quinlan Cafe, and the Denver Botanic Gardens. Performer at Swallow Hill Music event. Photo courtesy of venue's Facebook page. Folk, Americana, and country artists you're likely to find performing at Café Nine include New Appleseed Collective, Kim Richey, Jason Eady, and Great Peacock. Additionally, they book local and national talent outside the realm of folk. This New Haven staple aptly bills itself as "the musician' living room." In other words, the venue is comfortable, inviting, and a great place to hang out and enjoy music. Old Town School of Folk Music not only educates, they celebrate too. Some of the folk legends that have performed at Old Town include Pete Seeger, Big Bill Broonzy, Jimmy Driftwood, and Mahalia Jackson. Their two music venues are Gary and Laura Maurer Concert Hall and The Myron R. Szold Music & Dance Hall. 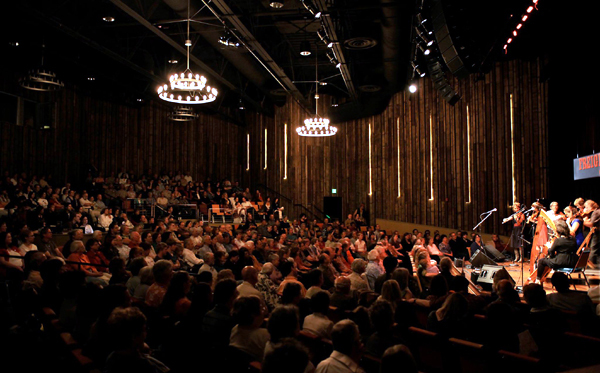 Both are intimate venues with acoustics and sightlines that are perfect for folk music concerts. For six nights a week, New Deal Café welcomes brilliant artists to the heart of Greenbelt. Folk and Americana performers are found all over their event calendar (so are jazz artists, pub quizzes, and open mic nights). The café, and its funky atmosphere, peddle delicious dishes for every appetite including vegans and vegetarians. Their coffee is to die for. Stepping into The Bull Run Restaurant is like stepping into a time machine. No, it' not bigger on the inside then it is on the outside, but it has been "serving the tired, thirsty traveler since 1740." Patrons from all walks of life assemble to enjoy stars like Steve Forbert, James Maddock, Roy Book Binder, Liz Longley, and Antje Duvekot. In between sets, make sure you check out The Drunkard' Progress Mural. 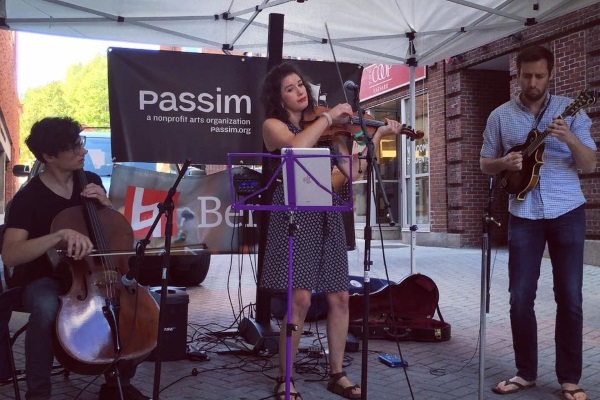 As they say on their website, Club Passim "present(s) music with a folk aesthetic." The nonprofit works hard to create an intimate atmosphere where artists and audience members can interact. Billed as a listening room, Club Passim seats 102 folk music enthusiasts. 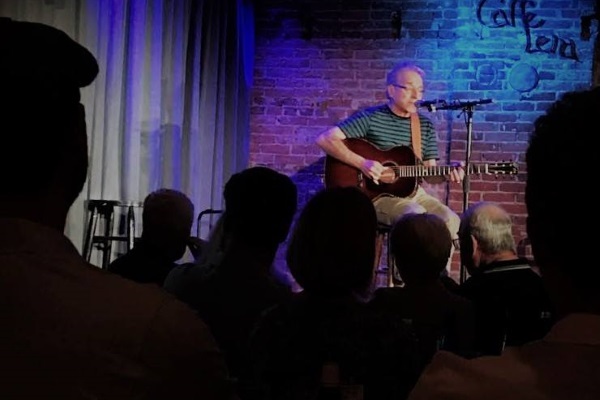 Over the years, Passim has hosted sets from such luminaries as Joan Baez, Peter Wolf, Suzanne Vega, and Regina Spektor. Performance produced by Club Passim. Photo courtesy of venue's Facebook page. Nameless Coffeehouse is situated inside The First Parish Church in Harvard Square. They've helped a bunch of musicians make a name for themselves including Tracy Chapman, Ellis Paul, Dar Williams, and Patty Larkin. This handsome and cozy venue was founded by Harvard students in 1966. The Rose Garden Coffeehouse has one goal. That goal is to provide indelible live folk music at affordable prices and to do so in an embracing environment. Fortunately for folk fans, this all-volunteer, non-profit consistently achieves its goal. The Rose Garden Coffeehouse was founded in 1989 and they hold their concerts at the Congregational Church. A dedicated group of volunteers run the South Shore Folk Music Club. 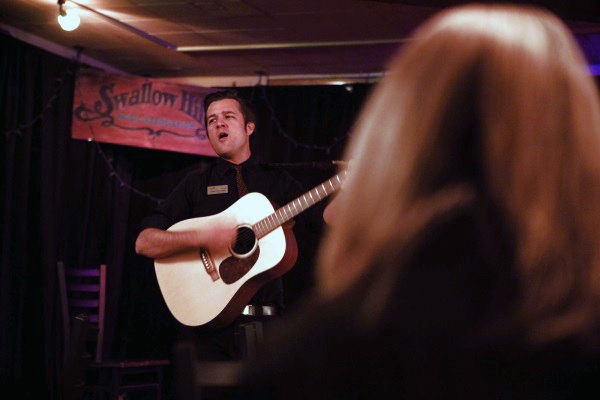 The club has been the heart and soul of the South Shore' folk music scene since 1978. They rent a space at the Beal House in Kingston. That' the community building belonging to the Unitarian Universalist Church. The club hosts coffee house performances as well as open mic nights. Do you love folk music? They're always looking for volunteers. When discussing The Ark, there are a few numbers you should know. Those numbers are 400 and 300. The Ark seats 400 folk aficionados and hosts more than 300 shows a year. Another number you need to know is zero. That' because the Ark is a nonprofit (zero profits) that preserves folk and roots music in Michigan. When you add all these numbers together you get one of the world' top music clubs. Few music venues can brag about a positive review from the Library of Congress. Caffe Lena is one of them. The LOC calls Caffe Lena "an American treasure." Why such high praise? Caffe Lena is widely regarded as the "oldest continuously operating folk music venue" in the country. And yes, Bob Dylan played there. No wonder their tagline is "Good Folk since 1960." Happy Traum performing at Caffe Lena. Photo courtesy of venue's Facebook page. Even though Hank' Saloon isn't exclusively dedicated to folk music (they book a lot of great rock acts too), they make a lot of lists chronicling the "best folk music venues in New York." Hank' is an ultra-cool dive bar located a mere block away from the Atlantic Avenue Terminal. Most of their live shows are free. The Jalopy Theatre and School of Music supports traditional roots music. That includes folk, bluegrass, and world. The Jalopy empire also includes an internet radio station and record label. If that wasn't enough, they also run a vintage instrument store. Geoff and Lynette Wiley founded Jalopy in 2006. Folk fanatics are glad they did. The performance space at Pete' Candy Store is shaped like a Pullman car. Depending on when you visit, you're likely to experience a top-notch folk artist, someone like Abby Hollander, Sarah Wise, Tom Moran, and Travis Hayes. Live music is a daily occurrence at Pete'. They also host trivia nights, poetry readings, and stand-up comedians. The world-famous Rockwood Music Hall is renowned for its acoustics and booking up-and-coming talent. Sure, they schedule a variety of acts, but their space is popular among Americana artists—both Chris Thile and Gabriel Kahane have taken to their stage. The venue also lends its name to a record label, Rockwood Music Hall Recordings. Washington Squares performing at Sidewalk Café. Photo courtesy of venue's Facebook page. From the outside, it' not much to look at. On the inside, it' full of good people, good times, and good live folk music. If you want to listen to some folk or bluegrass, and your buddy doesn't, then compromise by visiting Sunny'. Why? Even if folk music isn't your jam, Sunny' atmosphere and regulars will ensure that everyone has a terrific time. The Balzano family has owned this neighborhood destination since 1890. 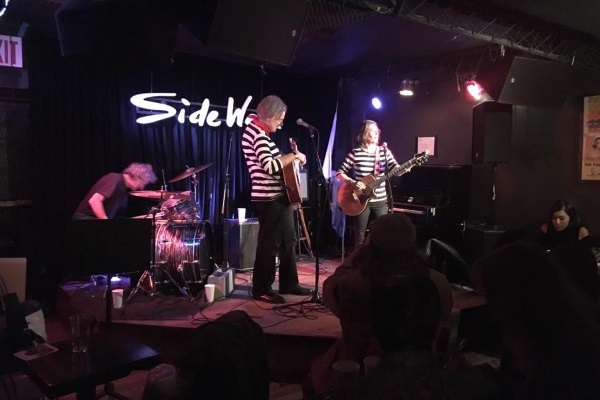 Towne Crier Café has been booking memorable live Americana roots and world music acts since 1972. They host two different open mic nights—one on Monday and another on Wednesday. Towne Crier Café is a bona fide "listening room." They also have a mouthwatering menu. Ergo, when you visit TCC, bring your appetite for music and cuisine (especially desert). The Evening Muse is for lovers… music lovers. Found in the NoDa Arts District of Historic North Charlotte, the Evening Muse has ear-pleasing acoustics, an immense selection of alcoholic beverages, and original artwork hanging on the walls. The Muse ‘s stage spotlights independent musicians and songwriters, many of them from the genres of folk, Americana, and country. Laurelthirst Public House opened in 1988 and is situated in Portland' Kerns Neighborhood. Yet, it' at the heart of Portland' folk, bluegrass, and Americana scenes. Come early, grab a beverage, or glass of wine, and hang out with your friends. It' a good place for doing that stuff too. Laurelthirst has the distinction of being the Rose City' oldest independent music venue. What kind of music does The Lansdowne Folk Club promote? The answer is simple: "folk, acoustic, and blues." The non-profit organization was founded in 1993. They produce concerts at the 20th Century Club. Operated by a cadre of volunteers, the club has a marvelous reputation and is routinely heralded as one of the best music venues in the Philadelphia area. Bob Beach and Kiley Ryan performing at The Lansdowne Folk Club. Photo courtesy of venue's Facebook page. Stone Soup Folk Arts Foundation was inspired by Pete Seeger and named after a folk tale about a beggar who makes soup. It' also one of New England' oldest coffeehouses. The foundation produces concerts on Saturday night from September through may. Ingrid Michaelson, Catie Curtis, and Greg Brown are just a few of the fabulous artists that have appeared on Stone Soup' stage. Who can you see at McGonigel' Mucky Duck? A bunch of spectacular folk and Americana artists like Pat Byrne, Lilly Hiatt, Radney Foster, John Fullbright, and Jaimee Harris. If you want to see tomorrow' stars today, then check out McGonigel's open mic nights (see their website for details). Established in 1990, the world renown Mucky Duck hosts the "livest music in Texas." With an address in downtown Houston, MKT Bar takes cares of its patron by serving them high-quality folk and Americana music as well as huge portions of classic comfort food. Their mood is laidback, yet dynamic. MKT stands for "market" and they book acts like Sara Van Buskirk, Max Flinn, Jawad, and Hogan & Moss. 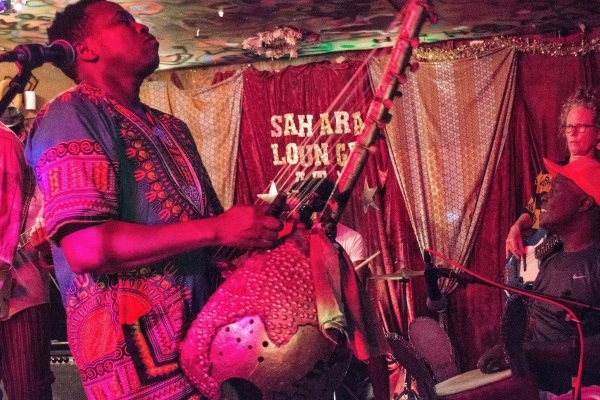 The Sahara Lounge rolls out the red carpet for a cornucopia of talent including those performing African, Brazilian, and folk music. They've been hosting an "Africa Night" for more than half a dozen years. You need to attend one—the music and crowds are a blast. We guarantee that you'll find this charming eastside haunt diverse, relaxing, and vibrant. Performance at The Sahara Lounge. Photo courtesy of venue's Facebook page. Yes, The White Horse is Austin's best "whiskey slingin' honky tonk." Sure, the acts they usually book don't strum "If I had a Hammer." Still, attending The White Horse means you'll differently hear music of the people. Besides incredible live tunes, The White Horse can also teach you how to Cajun dance (as well as other steps). While you're there, enjoy one of their $3 bomb tacos. If you love live folk music, and its Friday night, you need to visit Uncle Calvin' Coffeehouse. They are a nonprofit, that' run by volunteers, and located at the Northpark Presbyterian Church. Every year, they host about 40 concerts (mostly on Fridays). Uncle Calvin' is touted as the heart of folk music in Big D. Meanwhile, Northpark is praised for being a comfortable and intimate music hall. The Brindley brothers bought Jammin' Java in 2001. Thanks to their dedication and hard work, their establishment is now nationally renowned. The siblings were even mentioned during a speech by the President of the United States. 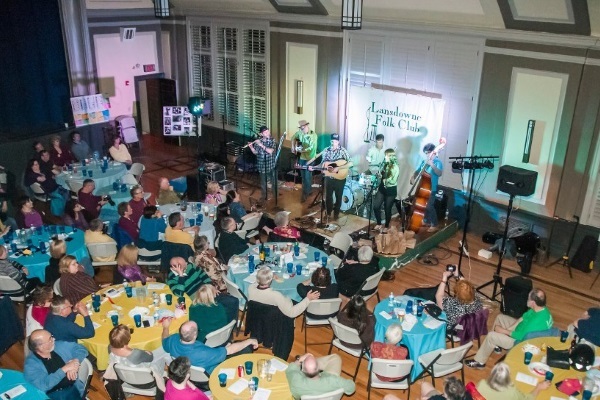 Their astounding venue seats 200 and frequently welcomes a variety of local folk talent. Jammin' Java also host concerts for children. Stone Room Concerts is a non-profit organization that offers folk adherents a quality live music experience. STC began in 2013 by producing concerts at a bicycle shop. Currently, they book concerts at two local churches as well as organize private house concerts. In fact, they have more artists then venues so they work diligently to find places with a penchant for folk music. 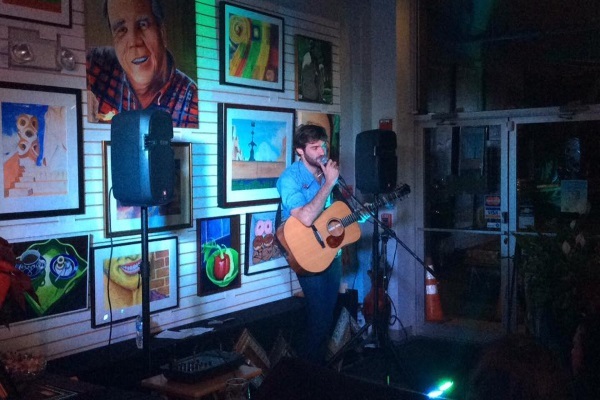 John Craigie performing at a Stone Room Concerts' event. Photo courtesy of venue's Facebook page.